The 3 sided triangle on the back of the crystal allows for those truths to verbally spoken. 3 represents the power of speech and the ability to creatively and joyously express. The powerful combination of the 7 takes the mind within to find wisdom. 3 enables that to be manifested and shared through the spoken word. information with intelligence. A Channelling Crystal is sometimes called a Spiritual Growth Crystal or a 7-Sided Crystal. one who has dedicated herself or himself to discovering their true nature and relationship with the One. Nucleus of All That Exists. The number seven was sacred to several deities, including Apollo, Ares, Artemis, and Osiris. and upward movement; synthesis; multiplicity; and the ability to speak Absolute Truth. and the beginning of a new slightly higher turn on the spiral of your continuing journey. back on track with the true purpose of any meeting, to do what you came to do. 'channel' information from You to you. 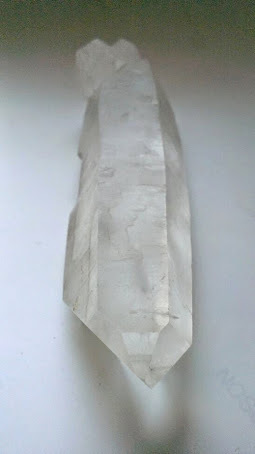 Use this crystal as a booster or fine-tuner to align you to your Higher (Source) and Inner Self, and then beyond. probably be one of your personal stones and kept away for other people, but use your intuition on that one. Symbolizes the Spiritual Seeker, the Mystic Student. Symbolizes Spirit perfecting itself within Matter. Symbolizes the Seven Cosmic Stages of spiritual development. Represents the Seven Celestial Tones and Seven Celestial Spheres. Symbolizes the integration of Body, Mind, and Spirit as linked to the Seeker. The Sage of the Crystal Clan. One of the true channelling stones (as is a Kyanite blade). Helps you align more directly to your Higher Self (Source Self) and maintain that alignment. 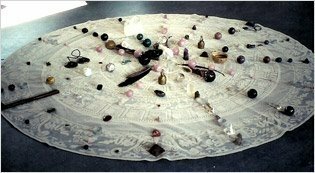 Stimulates a strong desire for wisdom and integration with the One. Generates a desire for truthfulness, especially with yourself. Boosts any and all consciousness within its immediate environment. Represents the seven qualities human consciousness must attain and master to access the Total Self. Activates and connects the 4th, 5th, 6th, 7th, 8th, 9th, 10th, 11th, and 12th chakras.